Ellie Lundin, a 2006 member of Blue Stars, sent this picture. 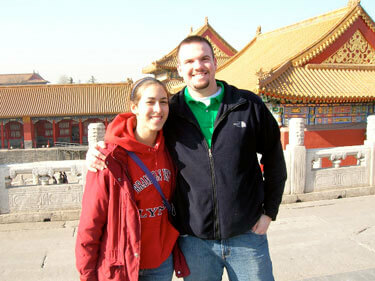 This photo was taken in the Forbidden City in Beijing, China. The Augustana College Band from Sioux Falls, S.D. went on a 20 day tour of China this January. Jared Goede (right) and I (left) were both excited to be on "tour" with another corps member. It was amazing there, and we'd make references about drum corps tour during the trip. Jared marches as a member of the Colts playing tenors and this is his third and age-out year. I'm a trumpet player with the Blue Stars, starting on my second summer.